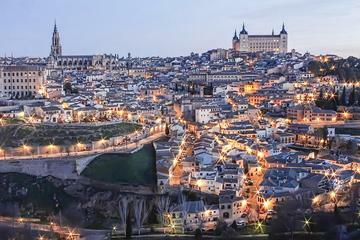 Toledo is the heart and soul of Spain. This monumental ancient city is a captivating UNESCO World Heritage Site. Behind its daunting medieval walls, in a labyrinth of winding pedestrian streets, are some of most important historical landmarks in the country. Magnificent old stone buildings and quiet cobblestone streets whisper the legacy of the past. For centuries, Christians, Jews, and Muslims flourished in a "city of three cultures" and built a dazzling array of churches, convents, palaces, fortresses, synagogues, and mosques. For a magnificent and unforgettable view of Toledo and a sense of the city's setting and topography - hard to see when you are in its center - climb or take the hop-on-hop-off bus across the river to the Mirador del Valle. Toledo is known for its traditional crafts, including damascene metalwork, antique-inspired swords, and handmade marzipan (sweet almond candies). However, the most famous art works of Toledo are the masterpieces by El Greco displayed throughout the city's churches and convents as well as at the El Greco Museum. Toledo is a popular day trip from Madrid, half an hour away by train, but it is well worth planning more time here to see all its treasures. With its soaring tower and marvelous Gothic architecture, Toledo's cathedral is one of the most important Christian landmarks in Spain. The cathedral was built in the 13th century on the site of a Muslim mosque next to the Judería (Jewish quarter). The exterior is somewhat obscured by the tightly packed buildings surrounding it, but the interior is breathtaking. Admire the grandiose sanctuary decorated with a rich collection of paintings. 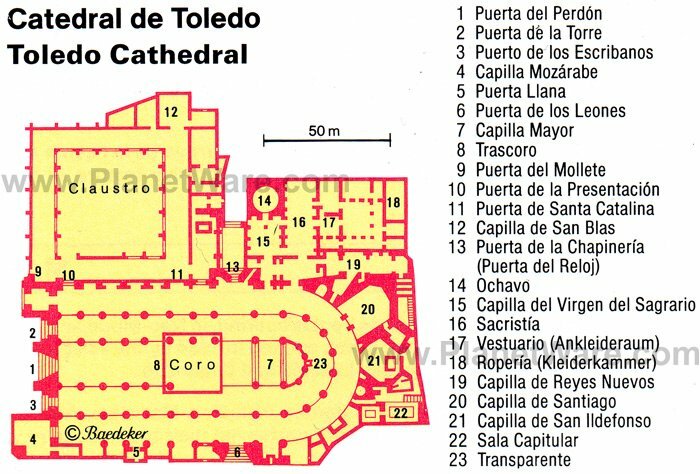 The wealth of masterpieces reflects Toledo's status as a center of the Catholic church from the 13th-15th centuries. To enter the cathedral, worshippers must walk through the Puerta de Mollete doorway. The Spanish word mollete mean "muffin" and takes this name because at this door, food was distributed to the poor. An enormous soul-inspiring space, the interior stretches 120 meters in length with five naves. A collection of 88 richly decorated columns makes a striking impression. Look up to admire the sanctuary's delicate ribbed vaulting and beautiful stained-glass windows dating from the 14th, 15th, and 16th centuries. The choir is considered one of the grandest works of art in Christendom, with masterfully carved Renaissance stalls. The stalls in the lower tier feature historical scenes from the Catholic Monarchs' conquest of Islamic Granada, and the upper tier depicts Biblical scenes by Alonso Berruguete and an alabaster Transfiguration in the left-hand section. Surrounding the choir is a Plateresque screen created in 1548. On the altar of the choir is a Romanesque-style stone figure of the Virgin Mary, the Virgen Blanca created in 1500. The richly gilded Capilla Mayor displays a huge gilded retablo of New Testament scenes with life-size figures, and the Churrigueresque-style domed marble altar is dedicated to the Virgin. The Flamboyant Gothic Capilla de Santiago contains the magnificent 15th-century marble tombs of the Condestable Álvaro de Luna and his wife. In the chapter house, are portraits by Juan de Borgoña and two paintings by Goya. A highlight of the cathedral, the sacristy has two exceptional paintings: El Greco's Disrobing of Christ (El Spolio) and Goya's Arrest of Christ as well as a series of 16 Apostles by El Greco. The sacristy also displays paintings by Morales, van Dyck, Raphael, Rubens, and Titian. Wander the atmospheric narrow lanes, relax in quiet courtyards, and visit artisan shops tucked away in little alleys of these adjacent neighborhoods in the heart of old Toledo. Especially in the evening, you can easily feel that you have stepped back into the Middle Ages, in the days before the Inquisition, when Christians, Jews, and Muslims lived together in mutual respect and harmony. Take time to admire the architectural details, including beautiful stone and brickwork, the graceful windows and doors, balconies, and the ironwork. In the Judaria, the old Jewish neighborhood, you'll find the streets literally paved in colored ceramic tiles, which are set among the paving stones. This Jewish quarter includes several historic synagogues, one of which, El Transito, houses a Sephardic museum that illuminates the rich Jewish life in Toledo before the Inquisition. While exploring the old city, you can even find remnants of Toledo's Roman past at the Roman Baths, northeast of the cathedral, and Cuevas de Hercules, where the Romans kept their water reserves. Northwest of the Judería and cathedral, the Monasterio de San Juan de los Reyes was a Franciscan convent founded in 1476. The church dates from 1553 and has an Isabelline doorway (from the epoch of Queen Isabel) by Covarrubias. On the exterior facade are the chains of Christians freed from Moorish captivity. The monastery has a sumptuous chapel with a single nave and a stunning vault. Especially noteworthy are the retablo by Felipe Vigarny and Francisco de Comontes and the friezes of the coat of arms of the Catholic Monarchs in the transepts. The 16th-century cloister is considered one of the finest examples of Late Gothic architecture in Spain. Looking out onto peaceful gardens, the cloister has a serene ambience that inspires spiritual reflection. In the upper gallery of the cloister, the ceiling features a very decorative artesonado ceiling. The monastery is open to the public daily year-round. The most prominent Jewish monument in Toledo, the Mudéjar-style Sinagoga del Tránsito is in the heart of the Judería that was a thriving Jewish community in the 14th century. Built in 1356 by Samuel ha-Levi, treasurer to King Pedro I of Castile, El Transito Synagogue is the most important example of Sephardic (Jewish-Spanish) architecture in existence. The synagogue is decorated with Moorish-influenced elements as well as intricate geometric and floral motifs, along with inscriptions in Arabic and Hebrew. Magnificent windows with cusped arches allow light to filter into the sanctuary. The interior also features an exquisite ceiling. After the expulsion of the Jews from Spain in 1492, the synagogue was given to the knightly Order of Calatrava. The rooms adjoining the Sinagoga del Tránsito house the Sephardic Museum, which educates visitors about the the history and culture of Spain's Jews. Be sure to see the Sarcófago de Tarragona featuring a trilingual inscription in Hebrew, Latin, and Greek. Near the El Greco Museum, the synagogue is open Tuesday-Sunday. Admission is free on Saturday afternoons and Sunday morning. This exceptional museum is housed in the 16th-century Hospital de Santa Cruz, an elegant building with an exquisite Plateresque facade. The Santa Cruz Museum includes three collections: Fine Arts, Decorative Arts, and Archaeology. In the Fine Arts collection, the paintings of the 16th and 17th century School of Toledo are the main attraction, especially the works by El Greco and Luis Tristán, a student of El Greco. The Assumption of the Virgin by El Greco is a masterpiece created in the artist's later years. Other highlights are the Christ in Chains by Morales and the Crucifixion by Goya. The retablo dedicated to the Virgin by Alonso Berruguete is another valuable piece. The Decorative Arts section includes Flemish tapestries of the 15th and 16th centuries and a tapestry illustrating the signs of the Zodiac as well as local artisan crafts. The Archeology section contains prehistoric, Roman, Visigothic antiquities, and exhibits of Moorish and Mudéjar decorative objects and ceramics. 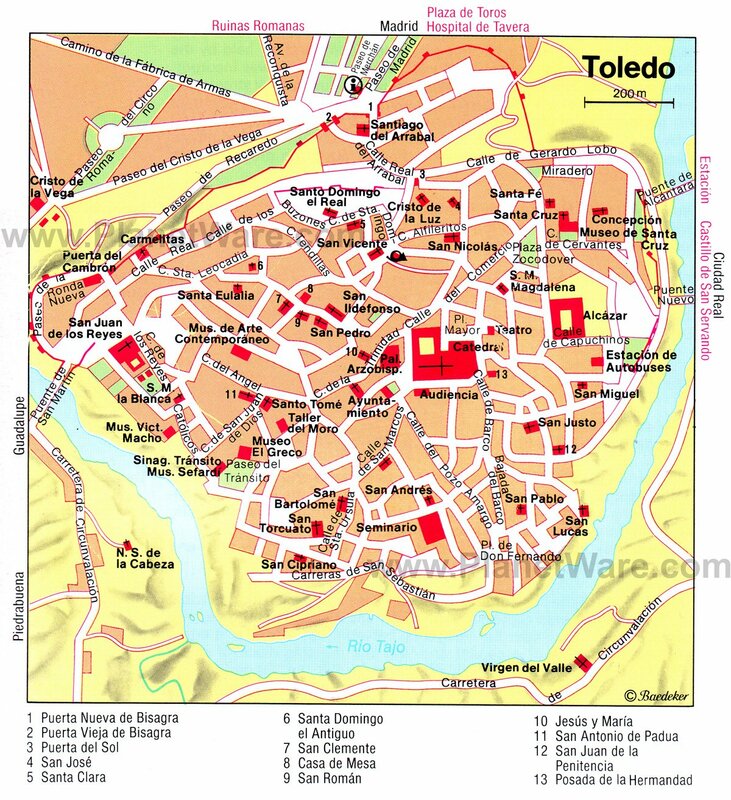 Constructed originally by the Romans, renewed by the Visigoths, expanded by the Moors, and enlarged again after the Christian reconquest, Toledo's walls are surprisingly complete today, with well-preserved reminders of their - and the city's - mixed history. You can walk along the walls, stopping in the little parks and at the gates that gave access to the city. The only remaining part of the Moorish town walls is the Puerta Vieja de Bisagra, a ninth-century entrance gate. Typical of Muslim architecture, the gate features horseshoe arches; a central arch is the entrance, and two blind pointed arches are for decoration. This monument is also known as the Puerta Vieja de Alfonso VI because the king made his entrance to Toledo in 1085 through this gate. The 14th-century Puerta del Sol is also impressive, built by the Knights Hospitaller. West of the cathedral bordering the Judería (old Jewish quarter), the 12th-century church of Santo Tomé is another monument that was originally a mosque. In the 14th century, the church was renovated by the Count of Orgaz in Gothic style with a Mudéjar tower. Several of the windows also reveal Mudéjar design with the characteristic horseshoe arch shape. The church possesses one of El Greco's most famous paintings, the Burial of the Count of Orgaz (created in 1586), which is displayed in a special room. The famous master of Spanish painting, Doménikos Theotokópoulos was born in Crete (Greece's largest island) in 1541, and in 1577 came to Spain where he was simply called El Greco ("The Greek"). The Casa El Greco in the Jewish quarter near the synagogue of El Tránsito is the house where El Greco is known to have lived. Renovated in 1906, the building is decorated with furniture and sculptures that belonged to El Greco. In the building adjoining the Casa El Greco is the Museo El Greco. On the first floor are three rooms containing more than 20 works by El Greco, including famous paintings View of Toledo, Christ with the Apostles, the Crowning with Thorns and San Bernardino. The museum also displays paintings by other Spanish painters including Zurbarán and Miranda. A few centuries older than El Transito, this magnificent 12th-century Mudéjar synagogue is in the Jewish quarter (Judería) of Toledo, which at one time had at least ten synagogues. After the Christian Reconquest of Toledo in 1405, the synagogue was converted to the Church of Santa María la Blanca. The splendid sanctuary features rows of pillars supporting 28 horseshoe arches, obviously influenced by Almohad-era Moorish architecture. The arches are supported by columns adorned with pine-cone capitals. Also noteworthy is the artesonado (decorative coffered wood) ceiling, characteristic of Mudéjar design. In the eastern wall of the building, which faces the direction of Jerusalem was an ark that held the scrolls of the Torah. Elements of the later Christian church include Plateresque altars and an altarpiece by the School of Berruguete. The monument is no longer used as a house of worship but is open to the public for visits. A fascinating monument that reflects Toledo's multicultural heritage, this little chapel was built as an Arab mosque in the year 999 on the site of an earlier Visigothic church. Concealed within a brick a wall, a precious statue of Christ from the church was discovered by Alfonso VI and El Cid. The original Moorish building has remained intact with its arcaded facade and a series of vaulted horseshoe arches in the sanctuary that recall the Great Mosque of Cordoba. Some of the interior columns are from the Visigothic church. In the 12th century, the mosque was converted to a Christian house of worship; the transept and Romanesque wall paintings date from this period. The apse with its blind arches exemplifies Mudéjar-style (Islamic-influenced) architecture. Standing watch over the city, the Alcázar has a commanding presence on its hilltop location. This ancient Moorish fortress, built on the site of an earlier Roman fort, was later renovated by the Christian Kings (Alfonso VI "the Brave" in the 11th century and Alfonso X "the Wise" in the 13th century). The imposing fortress has a square shape with crenellated defenses and four corner towers added under the reign of Emperor Charles V in the 16th century. The facade also reflects the Renaissance style from the period of Charles V. During the Spanish Civil War, the Alcázar was used as a Nationalist garrison and is considered as a monument to the heroism of Franco supporters. The Alcazar has been restored and now houses an Army Museum with excellent exhibits about the Civil War. The Alcázar is reached from the Plaza de Zocodover, a lovely square at the center of Toledo that is lined with elegant arcaded houses. At 7 Plaza de Zocodover, the well-known Santo Tome confectionary shop tempts visitors with its delectable handmade marzipan candies. Near the cathedral in a charming square is the Baroque church of Saint Ildefonso. The church has an imposing twin-towered facade and an awe-inspiring bright interior with two paintings by El Greco. Tourists can visit the church and climb the tower for sensational views. Below the Hospital de Santa Cruz, the Puente de Alcántara spans the dramatic gorge of the Tagus River. Originally an ancient Roman structure, the bridge was completely rebuilt by the Moors in 866. The present bridge dates mainly from the 13th and 14th centuries. The Puerta de Alcántara gate tower dates to 1484, while the Baroque gateway was built in 1721. From the bridge, visitors enjoy magnificent views of the Alcázar and the town, rising steeply up above the river. Outside Toledo's ancient town walls, the 16th-century Hospital de Tavera is a large complex of buildings filled with notable works of art. Tourists can visit the courtyards, church, and sacristy. Special guided tours also allow access to the museum and pharmacy. The church has a stunning marble facade by Alonso Berruguete. Precious works of art in the church include the marble sepulcher of Cardinal Tavera by Alonso Berruguete and sculptures by El Greco as well as the Saint Peter Crying painting by El Greco. The sacristy is filled with masterpieces of Italian art. The museum contains most of the important art works, including paintings by El Greco, Alonso Sánchez Coello, Juan Francisco Zurbarán, Luca Giordano, and Juan Carreño de Miranda. One of the most famous works by El Greco at the Hospital de Tavera is the Sagrada Family (Holy Family) painting. High above the left bank of the river, opposite the Alcántara bridge, is the 11th-century Castillo de San Servando. The castle was built in the 14th century as a monastery, commissioned by Alfonso VI but also served military purposes because of its strategic location. The building is an exceptional example of a Mudéjar-style fortress in Spain. With its formidable towers, crenellated defense walls, and Arabic-style entrance gateway, the castle has an imposing presence. This monument is not open to the public. Tourists can only visit the exterior and the grounds. The 13th-century church of Santiago del Arrabal is found in an outer district of Toledo near the town walls. To arrive here, continue past the Puerta del Sol along the Calle Real del Arrabal. This church is one of the most stunning Mudéjar landmarks in Toledo. Built of brick and masonry, the building has a decorative exterior of portals framed by Islamic-style horseshoe arches. The church is not open to the public, but tourists may visit the exterior of the building. Luxury Hotels: In the old Jewish quarter, near the Sinagoga del Transito, Santo Tome, and El Greco Museum, Hotel San Juan de los Reyes, in an elegant brick building, has whirlpool baths and a good restaurant. Also in a historic building, Hacienda del Cardenal is built into the walls adjacent to the escalator into the old city. Eurostars Palacio Buenavista, which has a pool, is a bit out of town, but the free hourly shuttle is a welcome alternative to the 20-minute walk. Mid-Range Hotels: Hotel Pintor El Greco Sercotel is adjacent to the El Greco museum and has larger rooms than many in the old town. Some of the spacious rooms at Hotel Alfonso VI, next to the Alcazar in the middle of town, have private balconies. 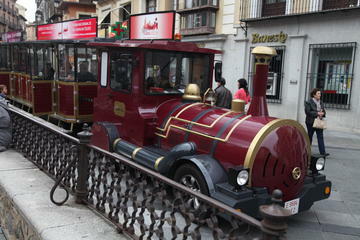 Hesperia Toledo is 10-minute walk from the center of the old city, or you can take a bus to save the climb. Budget Hotels: On a quiet street near the cathedral and El Greco museum, Hostal Santo Tome has large rooms with balconies and air conditioning. Also near the cathedral, Hotel Santa Isabel is in a 15th-century noble home, with spacious rooms and a rooftop terrace with a view. Rooms are small at Hotel Domus Plaza Zocodover, but the hotel is excellent value for its location near the Santa Cruz Museum. An undiscovered town deep in the countryside, Orgaz is an off-the-beaten path tourist destination 33 kilometers from Toledo. Orgaz has all the monuments one would expect in a historic Spanish town including an elegant Plaza Mayor, a magnificent 18th-century cathedral, ancient town gates, a medieval castle built in the 14th century, and several little hermitage churches. Those willing to travel five kilometers further outside Orgaz to Arisgotas are rewarded with an interesting cultural attraction, the Museo de Arte Visigodo (Museum of Visigothic Art). This wonderful museum displays rare examples of archaeological finds from the seventh century.